Lift Irish Band is an exuberant Trad trio based out of Central Florida featuring the music of Lamont Goff on guitar and vocals; Julian Lambertson on fiddle and vocals; and Olivia Stone on vocals, bodhrán, and cajón. 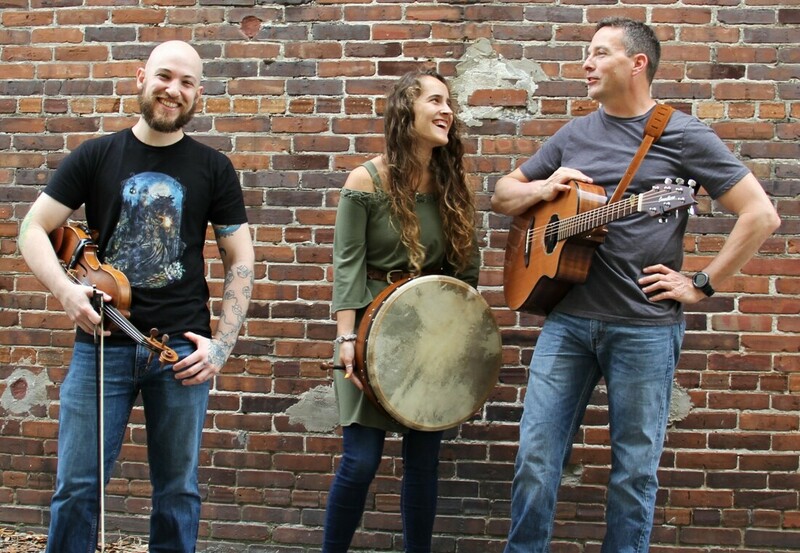 Their music combines dynamite traditional Irish playing edged with brilliant splashes of Scottish, Bluegrass, Blues, Funk, and Greek traditions. Alternating between songs and tune sets, Lift delivers lines and lyrics running the mood spectrum between driving, soulful, sassy, elegant, and heartfelt. ​​​Lamont started out as a bluegrass mandolin and guitar player. Eventually he heard the siren call of Irish music and seamlessly adopted its traditions while melding a sumptuous brew of jazz, funk, and bluegrass rhythms into it. Prior to Lift he was one of the original band members of Epcot and Celtic festival-favorite, Off-Kilter. Eventually Lift snagged him and made him play Irish guitar, mandolin, and vocals. He also performed with Liv in her band Traveler’s Highway. Lamont is a skilled sound engineer and producer, running a recording studio called Stealth Studio. Consequently he was the most excellent recorder, mixer, and producer of Lift Irish Band’s Self Titled album. ​A consummate musician of over 25 years, Julian has performed all over the USA and western Europe. Falling for traditional Irish music at a young age, he studied with some of the greatest fiddlers in the genre. Julian cut his teeth busking on Kansas City's mean streets, hence his imposing appearance. He was a founding member of the Irish band Oisre along with Zac Leger (Eilleen Ivers and Immigrant Soul, All-Ireland Uillean Pipes 2nd Place), and also played for years with the Irish bands Glen Road and Kelly. More recently Julian served as the fiddle player for the Celtic rock band Rathkeltair. Aside from performing with and managing Lift, Julian plays regularly with Kirk McLeod (Seven Nations) and Dean Andrews as the Celtic Rock trio Triple Dose. He is a sought after freelance fiddle player, most notably filling in for fiddlers with Epcot bands Alberta Bound and Quick Step, and with international Celtic Rock band sensation Seven Nations, as well as making an appearance on QVC TV for St. Patrick's Day in 2013. Olivia grew up in a musical family, playing in churches and for family gatherings with them until they started an Irish/folk band when she was 12 years old, the Stone Family Band. While in the family band she played mainly bodhrán and mandolin, all the while taking piano lessons and learning guitar. When she turned 18 Liv left for college and started a folk/Americana band with a hint of her Celtic roots, dubbing it Traveler’s Highway and performing her original music. In Traveler’s Highway, she was the lead singer, bandleader, organizer, guitarist, pianist, mandolin player, and songwriter. She also performs as a solo act. Most recently Liv returned to her Irish music roots singing and playing bodhrán and cajón as the newest member of Lift Irish Band.